Malta has been fought over by some of the greatest military minds in world history. Suleiman the Magnificent, one of the greatest Ottoman Emperors, drove the Knights from Rhodes and then launched the great attack against Malta in 1565. His revered admiral, Dragut Reis, perished in that siege, fighting opposite the inspirational Grand Master, Jean de La Vallette (the city of Valletta is named after him). In 1798, the young Corsican General Napoleon Bonaparte took Malta on his way to attack Egypt – a few years later he was crowned Emperor of France and set out to conquer Europe. His naval nemesis was Admiral Lord Horatio Nelson, who defeated the French fleet first at the Battle of the Nile and later, famously, at Trafalgar. More recently, during World War 2, Malta was bombed incessantly by Italian and German planes trying to destroy the British shipyards and submarine bases that lined the Grand Harbour. The entire nation was awarded the George Cross for Bravery by King George VI. In 1565, the Knights of Malta ruled over the islands, and their fleets of galleys were in constant battle with the navy of the Ottoman Empire. The Knights knew, though, it was only a matter of time before Suleiman the Magnificent attacked Malta to drive the Knights off the islands. The Order had been getting ready. Grand Master La Vallette ordered all Knights and their ships to come back back to Malta. The Knights and Maltese craftsmen mended or reconstructed old forts, and began to gather provisions and ammunition for the coming struggle. By May 6, the Grand Master could count 8,500 Maltese soldiers and 600 Knights. But would it be enough? Maltese people fled to safety behind the solid walls of Mdina and Birgu. They took everything they could carry – furniture, livestock and food – and settled in to await the attack. On May 18, the smoke signals went up. An armada of 180 Turkish galleys appeared on the horizon. Suleiman had entrusted his fleet to his greatest general and admiral, Mustapha Pasha Piali and Dragut Reis, who had mustered 40,000 soldiers and sailors for the attack on Malta. They carried 80,000 cannonballs and 400 tons of gunpowder. The city prayed. La Vallette ordered all the Knights to receive Holy Communion, and walked about Birgu and Senglea trying to inspire courage and confidence. 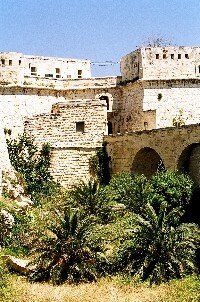 The Turks landed at four places on the main island, and headed straight for the forts and cities on the Grand Harbour. First they laid siege to Fort St Elmo. For five weeks they fired cannon and shot at its limestone walls, smashing the fortifications, but the Knights and their garrison never gave up. Once some men began to think they couldn’t hold on. They sent a message across the harbour to La Vallette, who replied, “Come away if you like. Other men and I will take your place“. Everyone stayed where they were, ashamed. But on June 23, the Fort was taken. The Turks had suffered too. Dragut was dead, along with 8,000 of his men. They now turned their attention on Birgu and Senglea. Inside the city walls, people were starving, buildings collapsed under the cannon fire, and the walls were battered daily by shot. The children were at war, too. They repaired the walls, nursed the wounded, buried the dead and carried food and munitions through the dangerous streets. If the Turks attacked, the children threw stones and dropped cauldrons of boiling water or burning wooden rings over the crumbling walls. La Vallette had asked the Viceroy of Sicily to send him help, but only a handful of reinforcements arrived. Then, on September 7, 8,500 men arrived in a small fleet. Church bells rang and the besieged cities rejoiced. The Turks’ surviving commander Mustapha was told that 20,000 men had arrived to help the Maltese, so he ordered a general retreat. By the time he had realised his mistake, it was too late. The next day, Malta was at peace and the long process of rebuilding began. On April 25, 1915, a large contingent of British Empire and French forces landed on the beaches of the Gallipoli Peninsula in Turkey. With the British forces were soldiers from all over the world: Indians, Nepalese, Irish, Scotsmen – and the men from Australia and New Zealand who would soon become known as Anzacs. The attack, and the planned invasion, failed. The Allied forces were bottled up on the beaches for months, suffering heavy casualties, unable to make any progress up the steep cliffs against a strong and determined Turkish defence force. In time, this battle became the essential part of the Anzac legend, still remembered on April 25 every year: Anzac Day. But for the men involved, it was a horrible, desperate struggle, and many were killed. Many more were wounded or got sick from dysentery or fever. The ill and wounded were shipped out to hospitals in Egypt, Greece, and above all Malta, where nurses and doctors worked around the clock in sometimes dreadful conditions, to save lives. So it was that during World War I, Malta became known as the Nurse of the Mediterranean. The George Cross is the highest decoration awarded in the British Commonwealth for “acts of conspicuous gallantry”and is equal to the Victoria Cross awarded in the military. It’s the highest honour that can be awarded for courage to people outside a battle zone or during peacetime. The medal was created in 1940 by King George VI and is only awarded for an act of the greatest heroism or of the most conspicuous courage in circumstances of extreme danger. In 1942, in the middle of World War 2, the George Cross was awarded to the islands of Malta. It had never before been given to a group of people. For months, Malta had been bombarded day and night by German and Italian air raids and a naval blockade which almost starved the population. This was the second Great Siege of Malta. In a letter to the islands’ Governor, the King wrote, “To honour her brave people, I award the George Cross to the Island Fortress of Malta to bear witness to a heroism and devotion that will long be famous in history”. The bravery of the Maltese people won widespread admiration among the allies, and you can still see the George Cross woven into the Maltese national flag.